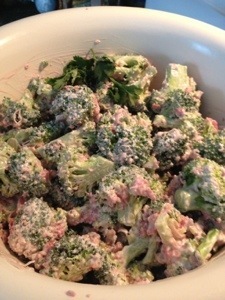 I love that broccoli salad that has the bacon bits and raisins and is kinda sweet…. I just had to find a way to modify it for my low carb diet. So here’s what I did and it turned out quite tasty! No one knew it was sugar free.